A Zoogz Rift album every Tuesday is a brilliant idea. I'll be sure to check out next week. Thanks for this one. Thank you Mr. Fab. ZR is in declining health now, and yeah, we all lost my late husband Richie Hass in 2008 to the blood cancer multiple myeloma. 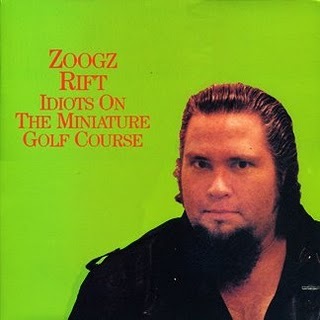 Zoogz did some amazing freaking music, and was also one hell of a wrestling manager for a while in the early '90s. With Zappa dead and Beefheart lost in his painting and ZR ailing it's the end of an era. This kind of intelligent, eclectic music is simply not being played because it takes too much work to learn it and play it. Michelle Klein-Hass aka Ms. Geek aka EliteLatteMac. Great to hear from you, Michelle. Was very sorry to hear about Richie. I know he released one cassette album that I don't have a copy of. If you want to send it to me to post, I'd love it. But if you want to keep it, hoping to re-release it someday, I certainly understand. From what I understand about Beefheart, he's had some kind of degenerative disease for decades, like MS or something. It's probably why he really retired to painting. So, yeah, he's out of the picture. THANK YOU for the Zoogz!!! 99% of the people I talk to don't know about him, but (thanks to my older brother) I became a big fan. I cant believe....I've never heard this guy before....argh!!!!! !...I'm a big big zappa/beefheart fan and have followed them all the way through...to the end.......now I find this guy and he's gone to.....jeeez......thanks for sharing this and remember......"The modern day composer....refuses to die".......cheers.